Think UP! Speak UP! Build UP! for 2014! TOMORROW NIGHT! (THURSDAY 9/26/2013) BELLA VISTA RESTAURANT IN PETERS CREEK, AK 7PM WE’LL SEE YOU THERE! HELP BUILD UP AMMC!!! AMMC Racing is on an Upswing! We are hoping you will join us in the upswing of things for 2014!!! Alaska Motor Musher’s Club will hold an annual general membership meeting in September 2013. The date of meeting will be announced through email, posted on FB and at this website. This is a meeting that gives AMMC’s membership the opportunity to bring up questions, concerns and offer valued input. Be a part of the upcoming season! TO VOTE you must be a member of AMMC Racing! Plan on becoming a member? Help build the membership by becoming one, by re-registering early or by recruiting new members! Please see registration page for more information on how you can become a member. A pay online feature will be available and announced in August. Please consider joining as a family, this gives your family members who do not race the chance to feel a part of the club and by doing so helps build a stronger organization, the bigger the organization the bigger the voice! Want to serve your club and it’s membership? We will have open seats to serve on the board, are you interested? Want to nominate someone? You can do this by sending a quick email to the ammcracing@ymail.com. “That’s not how I would do it”… you hear this said often in organizations, but we say…If you see where things could function better, maybe YOU are the answer!!! Let’s keep it positive folks, we love the help! Race days: We can use help with sign ups, manning checkpoints, trail sweeping, hanging up banners, handing out awards, announcing when needed. Behind the scenes: Pre-Race trail marking, fundraisers for the 120cc division and general fund, occasion errands running, data entry to record membership information, bookkeeping assistance for our Treasurer as needed, sponsorship work, shopping, & early planning for upcoming events. At the upcoming September meeting we will discuss the upcoming racing season, the structure of the races for XC & 120cc races for the kids & the much loved Annual Iron Pup, great fun for families =-). $$$$We want to hear input on race series opportunities for XC & what can we do for guaranteed payouts for our Pro Class, this must be planned! A question to discuss…Will we continue with Arctic Man in 2014? If so, we need willing bodies to commit to this very expensive event, also the expenses should be discussed, we say…when it’s planned anything is possible! Also we may touch on Alyeska Motor Madness for 2014. Vintage Racing? Since 2012 We have encouraged the vintage racers to check out Mat-Su Vintage Snowmachine Racers Club-Alaska for their vintage racing thrills; however, we do have interest from folks who wish to see AMMC re-open a vintage division, unless we keep this program low buck racing and purely for fun and entertainment this would take a whole new group of people (racers) with interest in vintage as vintage is it’s own whole program so for now we are still encouraging vintage racers to seek their fun times with vintage racing at MSVSRC as they seem to be doing a great job and we support that, but we do want to listen to what our membership has to say. Ice Racing? – What is going on with this division? Anyone? This Division is a thrill seeking division for not just the racer but the spectators as well! 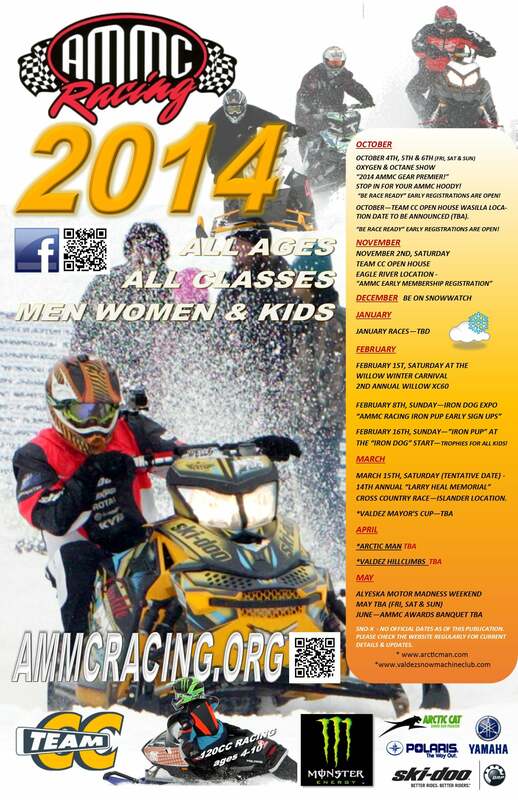 AMMC Currently does not offer Ice Racing and much like Vintage would take it’s whole group of people. Think Up, Speak Up, Build Up…anything is possible with positive thinking! One of the large concerns of course has been and still is our Division of Sno-X & possibilities for a location – We need Anyone’s & Everyone’s help on this!! It has been mentioned that Willow area may be a good place to explore, can you help? Is it time to revisit and become an ISR Affiliate? We want to discuss with the membership (racers) all Insurance options, do we continue with Lions or is it time to revisit ISR as an option so that our racers are recognized as racing a sanctioned race and may be eligible for contingency awards from participating manufacturers, our racers currently do not have the opportunity to enjoy these benefits, plus ISR can be explored for insurance specific to the racer at the racers expense of course. ISR will be able to give us quotes in September so please stay tuned for that information, all to be considered and discussed. We may discuss the subject of working with Iron Dog more in 2014, they have some exciting ideas for the upcoming Iron Dog races for 2014 & 2015. AMMC Racing is a 501c3 non-profit organization and what holds us accountable to this is our work in communities, our membership can and does help! Are you involved yet? You may help in upcoming fundraisers that promote supporting needs in our communities, do you have an area in mind that could use our help? We will announce what work we as a club have accomplished in this area and new ideas for 2014! Think UP! Speak UP! Build UP! for 2014! Please come to the meeting and express your interest in helping build Alaska Motor Musher’s Club UP! Do you have something for the agenda? An official agenda will be posted in August! Please send in your items for the agenda early to ammcracing@ymail.com. Thank you for your time and we really hope to see a large turn out for this very important meeting as exciting times are ahead for the long running Alaska Motor Musher’s Club!